Chances are, no matter where you live in the world, you have heard of the Grand Canyon. You’ve probably heard of Yellowstone, too. And you may even know about Yosemite. These three places, with their awe-inspiring landscapes, are perhaps the three most-well-known (and most impressive) national parks in the United States. And they deserve that recognition – they are each unique and beautiful in different ways. But, believe it or not, there are other places in the U.S. that are just as amazing. They just lack the “National Park” distinction. 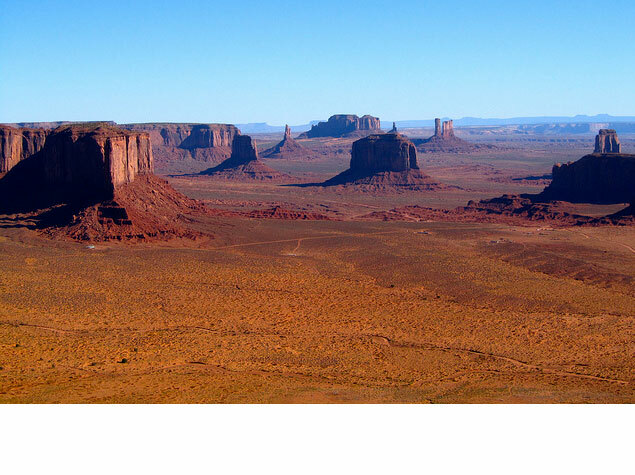 One of these places is Monument Valley, located along the Utah/Arizona border in the American Southwest. So why is this stunning landscape NOT a designated national park? With a guide: There are parts of Monument Valley that are not accessible without a licensed Navajo guide. Many of the beautiful sandstone arches in the valley (like “Ear of the Wind,” for example) can only be seen on a guided tour. Not only will you see more with a guide, but you’ll also get to hear a lot of the native stories associated with some of the more famous rock formations. On horseback: You can also experience Monument Valley on horseback. And, really, what’s more “Western” than that? From a hot air balloon: Hands-down, the coolest way to see Monument Valley is from the air. The buttes and plateaus take on completely different shapes from above, and floating over this place will give you an entirely unique perspective on it. Many hot air balloon tours will include a guided tour of the valley after your flight, meaning you’ll get to see the best of everything Monument Valley has to offer. Monument Valley is just one of MANY parts of the United States that could rival any of the popular and well-known national parks that you’ve already heard of. Keep this in mind the next time you’re planning an adventure in the U.S.
Have you been to Monument Valley? Tell us about it in the comments below.